I specialize in Robotic Prostate Surgery. James O. Peabody, MD, is a senior staff member of the Vattikuti Urology Institute (VUI) at Henry Ford Health System in Detroit, Mich.
His specialties include urologic oncology and robotic assisted laparoscopic prostatectomy. He worked with Mani Menon, M.D., and the team from the VUI on the development of the Institute’s robotic surgery program. He has an interest in the teaching of robotic surgical techniques and serves as director of the Urology Residency Program at the VUI. In 1997, he was awarded the Joseph C. Cerny, M.D., Resident Teaching Award. Dr. Peabody received his medical degree from the University of Michigan Medical School in 1985. He did his postdoctoral training in General Surgery and Urology at Henry Ford Hospital, finishing in 1990. Dr. Peabody has authored 8 book chapters and more than 20 journal articles, and has more than 30 abstracts published. 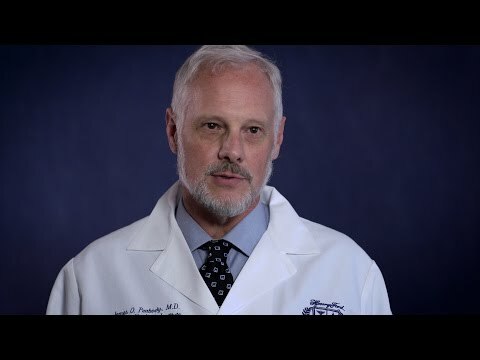 Dr. Peabody is a member of multiple professional societies including the American Medical Association, the Southwest Oncology Group, the Michigan Urological Society, the American Urological Association, the Northeast Medical Association, and the American College of Surgeons, the European Urologic Association and the Societé Internationale d’Urologie. He served as president of the Michigan Urological Society.